The title to this essay might seem like an odd question. On one level the answer is really quite simple: the beginner is the person who just walked in through the door. But on another level, you'll sometimes hear experienced martial arts practitioners say: “I’m still a beginner.” This isn't just false modesty either. There is some truth to the notion that even an experienced martial artist can be a beginner. Because in the end, it’s all relative. In February I will have celebrated 36 years of continuous training in the martial arts. Am I a beginner? Manifestly not, in the ordinary sense of the word “beginner”. But how does my 36 years compare with Kyoshi James Sumarac’s 50+ years of training? Or, for that matter, Master Chen Yun Ching’s 72+ years of training? In relation to them, I am a beginner. It also depends on what type of martial arts you’re talking about, hence my gif above of Ronda Rousey - a judo expert - boxing (more on her in a minute - note this is not a Ronda Rousey bash session!). I’ve done some boxing and judo. But in both I’m obviously a beginner. Ditto aikido and wing chun - at least, as regards doing things exactly as they are done in those arts. Within their paradigms I am manifestly a beginner. That’s why I never claim to do “aikido” or “wing chun” etc. I have studied some aspects of those arts. I have requisitioned some of their techniques. But in each case I have converted these techniques to my own paradigm. Take for example our version of muk yan jong (the wooden dummy drill). We do it our own way. We don’t do it purporting to "do wing chun". We might use the sequence, but the emphasis and delivery is quite different, drawn from our own combination of arts and our collective experience. 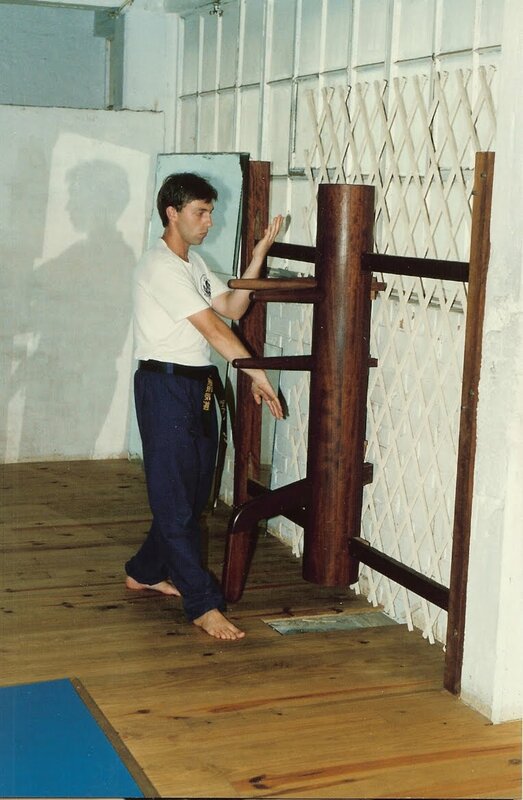 For example, we don’t actually use techniques like the pak sao (palm block) using the palm as a literal point of deflection - so replicating wing chun pak sao (which does) would make no sense. As a result, our "pak sao" - while delivered in a similar-looking way to the wing chun method - is subtly (but significantly) different. As is our stance/footwork when doing the drill. In other words, we are not "doing a bit of wing chun". We are doing our own thing - without apologies or any “cultural cringe”. Because while we might be “beginners” within the schema of another art, we are not “beginners” as martial artists and, indeed, as fighters. My brother and I each have 36 years of training, much of it “hard knocks”. We have cross-trained with multiple styles over all those years and kept an open mind. We are entitled as anyone of our experience to “do our own thing” and “reach our own conclusions”. This includes doing a wooden dummy drill our own way. Ditto techniques like kote gaeshi (wrist out turn) - both how to apply it and how to counter it. So if you felt kote gaeshi was an "aikido technique" you'd be sadly mistaken. Arts have no "copyright" over certain techniques. No one/thing does. On the subject of the wrist out turn throw - and how to counter it - almost every traditional martial art has something to say. Consider my article on this subject from a taijiquan perspective. That article also shows how karate and xingyi treat the subject. But let me not get side-tracked. The point is this: just because I'm a doing a kote gaeshi and defending against it does not mean I'm trying to do aikido. It follows therefore that while I am a "beginner" in aikido, it doesn't mean that by showing a kote gaeshi I'm inviting every aikidoka on the planet to write to me and tell me "where I'm going wrong with my basic (aikido) technique". And yet, just yesterday I had a long email of a kind I frequently get. In this particular case it was from a chap who offered a detailed critique of my form in arm bars, He also offered to give me some "tips" on how to "improve" my kote gaeshi but, mercifully, said he'd leave that to "another time". While this sort of email might be acceptable martial etiquette for a senior approaching someone who is greatly his/her junior, teachers do not, as a rule, approach students of others with corrections unless specifically invited. But here's the clincher: when the chap offered up his martial training experience - 6 years of aikido and iaido, and 3 years of Chen taijiquan - it was clear he wasn't my senior. Not by a very long shot . Even if you add his years together you get a total of 9. On what planet does this (potential total of) 9 years equate in any meaningful sense to my 36? I have been training at least 4 times as long (maybe even 6 times as long if there was an overlap in this chap's aikido/iaido and taiji training). While this person might not be a "beginner" in an objective sense, he is a beginner relative to me. It's really that simple. While I concede that I might well learn something from him (I learn from lots of people), why on Earth would I have any particular expectation that I will hear something from him that I haven't already seen/heard/read? Does something in my blog or videos suggest that I haven't cross-trained extensively in various arts under multiple teachers? Does something suggest that I am something other than obsessed with detail in technique - and constantly researching that detail? Going by my blog, is it really likely that in my 36 years of training I haven't come across some small variation known only to this relative beginner and his immediate circle of teachers? It's certainly possible. But to assume it as "likely" strikes me as very odd. I know what some people might say in response to the above: "My X years is much more meaningful than your 36 years - because I've been doing it 'right' while you've been doing it 'wrong' for all your years." This sometimes happens to me at seminars held by other martial artists. The more cloistered, inward-looking, stagnant, "we are the best" and/or "woo woo" the school is, the more likely this is to happen. Conversely the more pragmatic, open and respectful the system is, the less likely it is to happen. 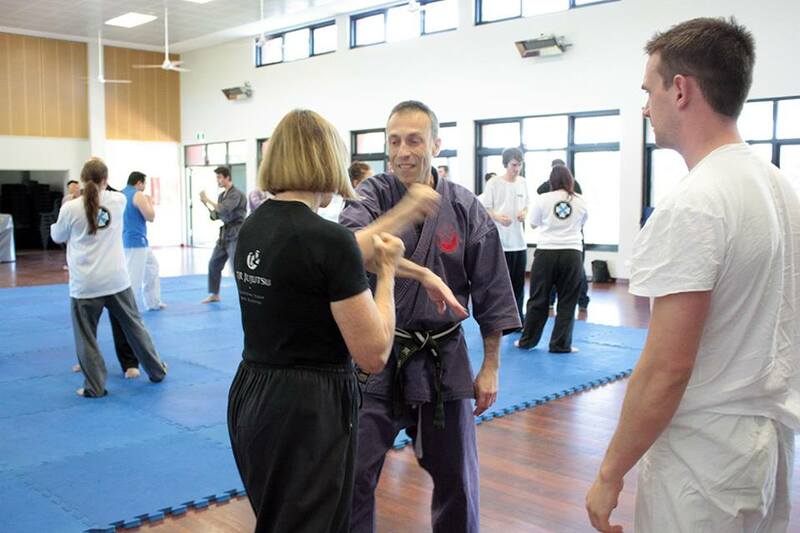 Consider the recent Ryukyu Martial Arts Friendship Gasshuku organised by Noah Legel. Or the IAOMAS event I attended last year organised by Colin Wee. Both events were the paragon of mutual respect. This sort of experience serves as the polar opposite of the time I attended a seminar of the late Erle Montaigue, and one of his local students (with whom I was unfortunately paired) kept rolling his eyes and "correcting" my every movement for the entire event. When he offered that he'd been training a whole 9 months, I explained that (at that stage) I had trained 12 years. He laughed. I suppose to him, I had been learning "brutish nonsense" for all that time, so none of it counted for anything (compared to his amazing 9 months). It takes a special kind of Dunning-Kruger stupid to think something like that in the martial arts. Which brings me back to my opening gif. Why did I choose an animation showing Ronda Rousey punching? Well I did not do so to make fun of her, as many idiots are presently doing. That is a kind of post hoc revisionism and "tall poppy cutting" I despise. Like many, I did not pick Rousey to lose her fight against Holm. I wouldn't have put money on it, but I was leaning towards Rousey winning (even though I started to feel nervous for her when she was clearly losing control of her emotions at the weigh-in). I saw her punching mitts and thought she was very fast and strong. Scarily so. I thought Rousey was going to make up for any flaws in her basic technique with other skills (of which she has many - in particular her grappling, but also her phenomenal ability to summon aggression and her fighting spirit). Is Rousey a beginner in stand up? Of course! Talent and drive are no substitute for experience. To me she looks like someone who has been punching/boxing for 4 years or so - without specific/good boxing coaching (apologies to her coach Edmond Tarverdyan, but that's how it seems to me as a striker, though not a boxer). Even if we assume 4 years of good boxing training, this is still only 4 years. Compare that with her decades of dedicated judo training. Compare it to Holm's decades of dedicated boxing training. They don't come close. Rousey can only be a beginner in boxing. No matter how talented she is, no matter how far Joe Rogan felt she had come in so short a time (see below), she was still a beginner in stand up. Again, I'm not suggesting that I "knew" Ronda was going to lose. Like Joe, I was impressed by her speed and power. But it remains a fact that she was and is a beginner in punching - relative to Holm and indeed most professional boxers. There is no substitute for time. A boxing coach will tell you that 4 years or so of punching is just not enough to climb into a ring to fight a world champion - or even just a good regional fighter. By contrast, Rousey is an exceptional master of judo and used this to dominate women's MMA - and bring both women's fighting and judo to the attention of the world. So Rousey is no "beginner" as a fighter - not by a long shot. So what makes a "beginner"? It's all relative. It depends on who you're comparing a person to and it depends on the skill on which you're focusing.